But implementation will not be straightforward. Each payment scheme has its own requirements, specifications and interfaces. Specifications are also updated regularly, requiring merchants to constantly maintain their systems to stay connected to the schemes. A token gateway enables merchants to bypass these integration challenges, however, as it provides a single software interface to multiple global and local payment schemes and is kept constantly up-to-date with the latest requirements. In this ebook, Rambus explains how a token gateway works and sets out its benefits in terms of reducing complexity, increasing security, lowering costs, shortening time to market and enhancing the consumer experience. 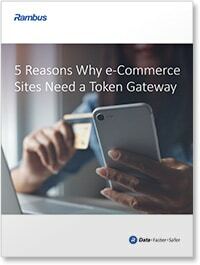 ‘Five Reasons Why Ecommerce Sites Need a Token Gateway’ has been produced and sponsored by Rambus and approved by the NFC World editorial team. This 12-page document is available free of charge to NFC World Knowledge Centre members (PDF format, 1MB).